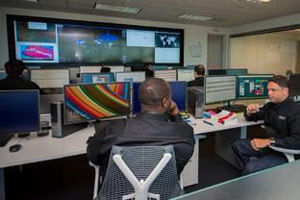 Threat Intelligence: Detailed analysis of valid security alerts are initiated within a state-of-the-art Security Operations Center (SOC) – staffed 24x7x365. Correlation: This data is securely transmitted to the cloud, in real-time, where automated cyber-threat detection technology sorts through millions of events through a complex process called correlation. on a 24/7 cyber-threat monitoring program.